Red Dust and Curry – Welcome to Myanmar! Myanmar felt like properly unknown territory for me, having only begun to open up to the world in recent years. I’m not even sure whether I’m still in south-east Asia, as even that seems to be a matter of some dispute. But what I wasn’t really expecting is that Myanmar is also a bit nuts (in a generally good way, so far). It begins before you even get through passport control. Bang in the middle of the border bridge from Thailand, traffic is expected to switch from the left to the right-hand-side. There’s some paint on the road, but not much else to show you how it’s done. The vast majority of cars and trucks in Myanmar, of course, are not designed to drive on the right. The government just changed the system a few years ago. Nobody seems to know why. Then there are the roads. 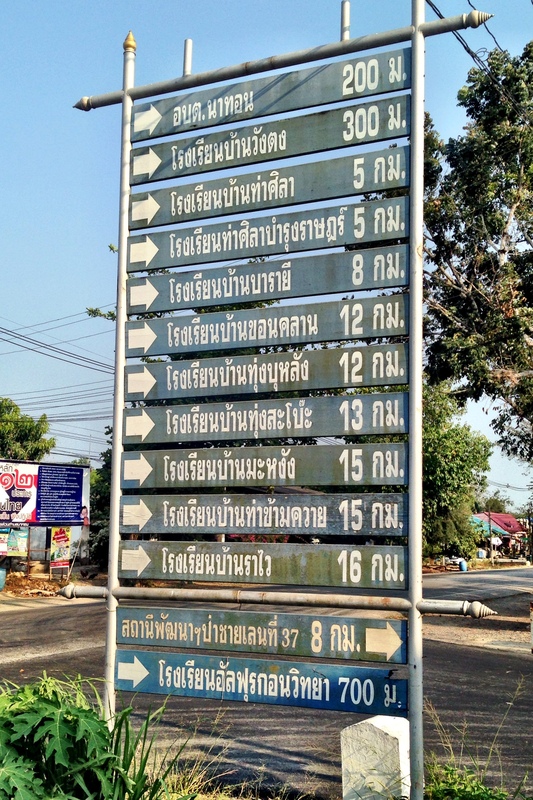 The road from the Thai border at Myawaddy used to be so poor that it only worked in one direction each day. Now there’s a new road (below). 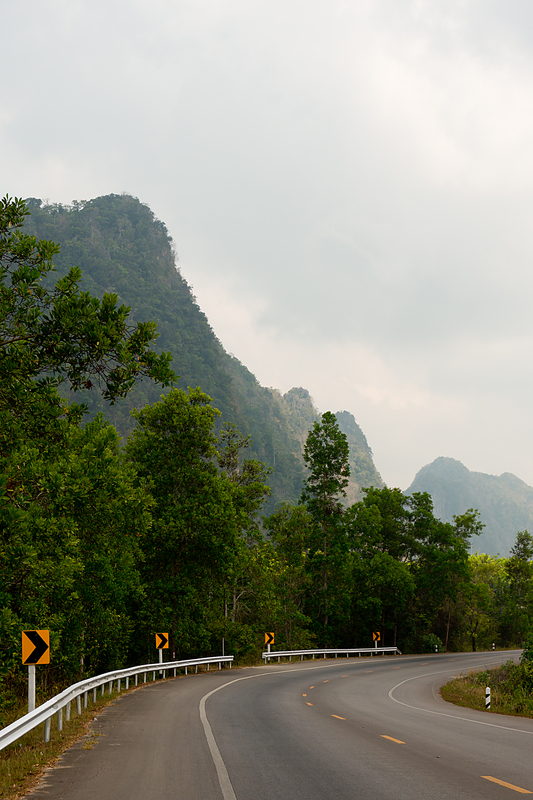 A beautiful, Thai-built, butter smooth highway, with a stunning, swooping descent off the top of the hills. This delightful introduction to the country opened last summer (2015), and follows a different route to the old road. But it’s not on any online map yet. You can see where it is only by looking at Google Maps’ satellite imagery, which shows where the trees were cut to make space for the new road. And so, you enter the country along a beautiful highway which the maps say doesn’t exist. 60-odd kilometres of fine, red dust, and a narrow, incredibly rough tarmac strip. Tarmac so narrow that, when two trucks or buses meet, at least one of them ends up on the dirt. Which puts the fine, red dust up in the air to decorate any unsuspecting bikers who happen to be in range. It has improved since, thankfully. Then, there’s the odd, half-hour time difference between here and Thailand. Why not go the whole hog, and make it an hour? Nobody knows. Again. And what exactly was the ‘pizza’ I found this evening? It looked like a pizza. It was described by the lady selling it as a pizza. It was, as far as I could tell, a cold, sweet bread bun with some sort of topping involving crabsticks and peppers. And some sort of tofu-like substance. And possibly mayonnaise. But definitely no cheese or tomato sauce. And very definitely unheated. I’m not sure what the dictionary definition of a pizza is, but I’m pretty confident that cheese, sauce and heat are fairly important to the recipe. Not in Myanmar, apparently. And how does a country where many of the villages still don’t appear to have reliable electricity (cool-boxes with ice, rather than fridges) have the fastest 3G speeds I’ve found anywhere? So, Myanmar is a bit confusing. Or, arguably, Myanmar is a seething mass of contradictions. I ran into two other touring cyclists yesterday (Wednesday), who blamed it mostly on the change that’s happening politically here. There are a lot of laws which still exist, but are no longer enforced. Or are sometimes enforced, and sometimes not, depending on the individual with responsibility. Or laws that no longer exist, but some people still think they do. Like I said, it’s a bit confusing. It’s also a very beautiful place (above is the town of Hpa An, where I spent last night). The people seem lovely (not just the policemen, though, given the amount of checkpoints, it’s much better for me if they stay nice, too). And, although the roads are a bit ropey, the road manners so far are generally very good, so you don’t feel too likely to end up in a bus sandwich. And I had a Indian-style chicken curry last night. With Chinese-style fried rice, obviously. Which is also a little bit odd, but illustrates the mix of cultures here. I’m a big fan of proper curry, and this is the first time I’ve found the Indian type done properly in the region, which is great news. It was delicious, and also massive, which is important for a touring cyclist. So where from here? Well, in addition to being slightly nuts and very beautiful and friendly, Myanmar’s a big country. I’m still a few days from the old capital, Yangon (used to be Rangoon), and it’s a long road to Mandalay from there. I passed 1000 miles for Part 2 of the round-the-world ride yesterday (i.e. 1000 miles from Hanoi), and there will be hundreds more on the clock before I get to India. I’m fully aware that I moan too much. Especially when I’m having a good time (at least in retrospect; it’s that Type 2 Fun thing again). Off the central hills of Thailand in time for New Year, and it then looked like a pretty easy run to the edge of the country, and the Myanmar border. Three relatively short days, two flat and one (today) a bit lumpy. 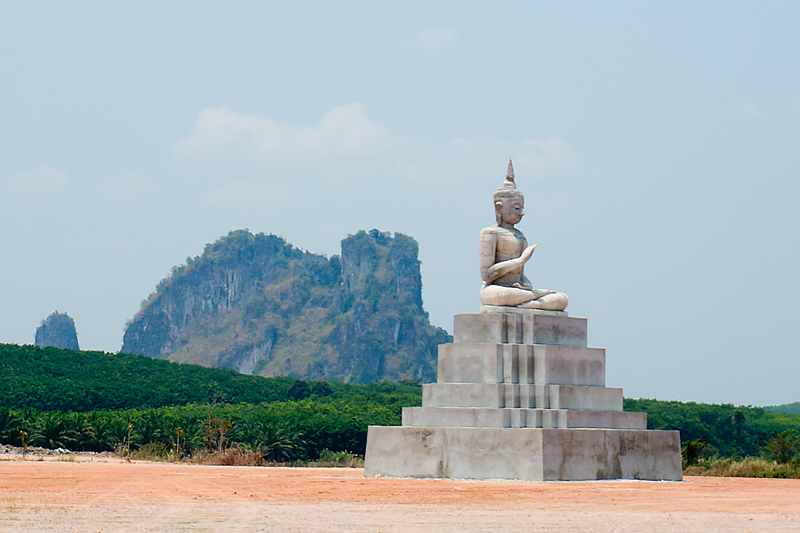 And the ancient Thai capital of Sukhothai to have a poke around on the way. Well, in three days of extremes, it was only really Sukhothai which delivered what was expected. 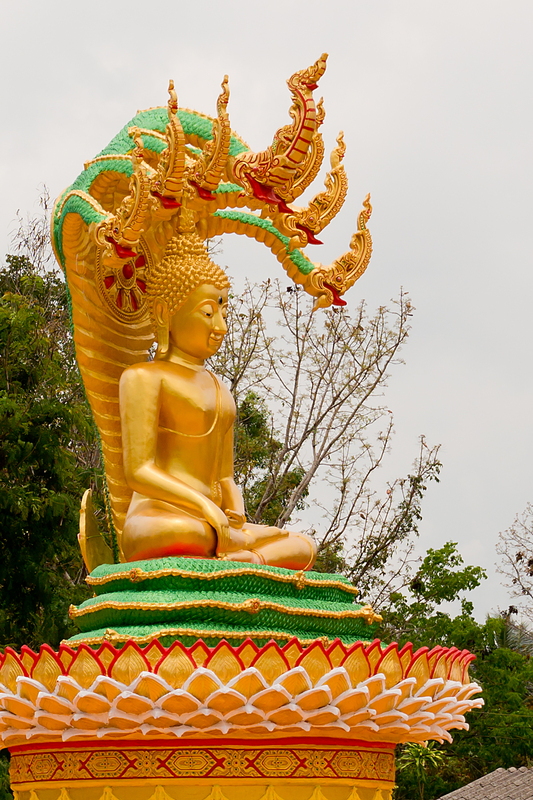 Stacks of ancient stupas and temples from Thailand’s ‘Golden Age’. I got on there on Saturday afternoon, in time to have a shower, some food, and then a stroll around the historical park (tick off another World Heritage Site) as the sun went down, and it was beautiful. The reason I was there so early was simple. The single flattest ride I’ve ever done on a bike. I know I was having a little whine about how flat it was when I first arrived in Thailand, but this was ridiculous. After a much more average ride to Tak yesterday (a few ups and downs, a lot of sunshine, a handful of trucks and exuberant dogs), the switch was firmly flicked today. Where I couldn’t find a single metre before, there was suddenly a glut. I’m not actually sure if you can have a glut of climbing. But there was definitely a surfeit of metres. You can tell you’re in serious hill country when your average speed takes a beating. Across central Thailand, I was still averaging around 20 kph (12 and a bit mph) through the hills. Today, I was 20% down on that; every steep ramp followed by a typically grudging Thai descent, followed by another ramp. Urgh! Still, there were some fairly decent views. And a really testing ride always leaves you feeling like the massive dinner you trough down afterwards is well-earned. Perhaps more importantly, it also boosts your morale. Because while I may moan about the hills, the non-hills, or the weather, it’s days like these (when they finish well, at least) that make the trip worth doing. Testing myself is part of the whole experience. And never knowing quite what’s coming each day is the whole point. There won’t be many days where I’m less sure about what’s next than tomorrow (Tuesday). Just six kilometres (call it four miles) down the road is Myanmar. I know they only began to open up to the outside world a few years ago. I know they drive on the right, but that most of their cars are designed to drive on the left. And I know that the border post at Myawaddy is reputed to be one of the friendliest in the world, for some reason. But apart from that, I don’t know much. Should be quite exciting. Can’t moan about that, at least, can I? A long, long time ago (in March), I put up a post based on my (possibly slightly over-stated) surprise at finding myself in the year 2558, Thai style. What I didn’t know then was that fate would decree a second visit to the the future. 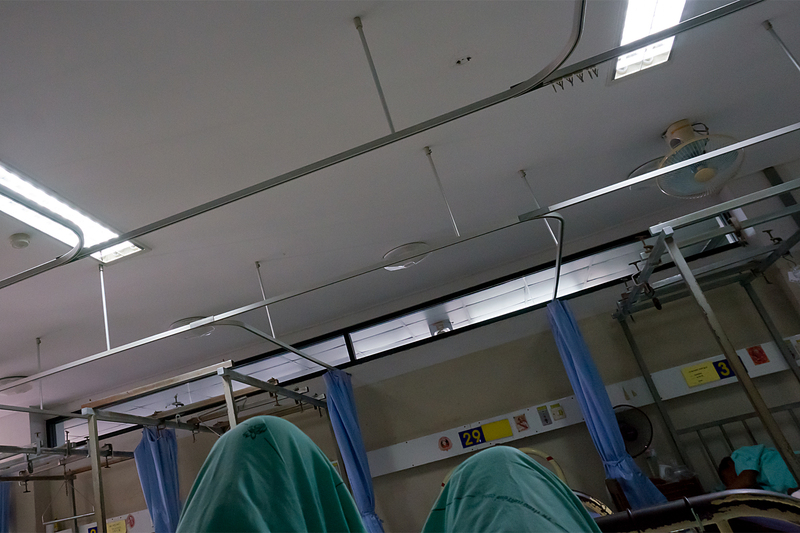 Within a couple of weeks of that post, I’d been squashed by a truck, sampled the Thai healthcare system, and returned home to the UK to recover. And yet, here I am again, back in 2558, and soon to tick into 2559. I rolled across the Mekong into the country which temporarily thwarted my round-the-world ambitions on Sunday (27th December). It still seems like a nice place, just like it did nine months ago. After spending over two hours negotiating the holiday carnage of the border crossing from Laos (what a contrast to my entry to that country, where I was the only person at the border post! 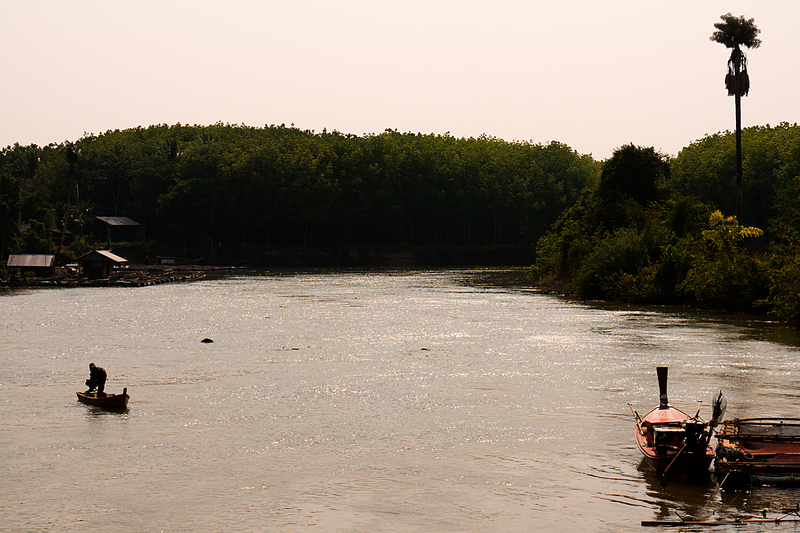 ), I was across the Mekong, back on the correct – that’s the left – side of the road, and pushing on. No uncontrollable fear when I heard big diesel engines behind me, which was good (although not entirely unexpected, as I gave this a good dry run in the UK in September). I am spending a lot of time glancing over my shoulder, though. The roads up here in the north are just as silky-smooth as those I rode earlier in the year. Thailand (at least in my experience, so far) has the best road surfaces in south-east Asia, which is saying something, as there are not too many bad surfaces to be found in the region nowadays (except in Indonesia). UK local councils take note; it is actually possible to build decent roads! 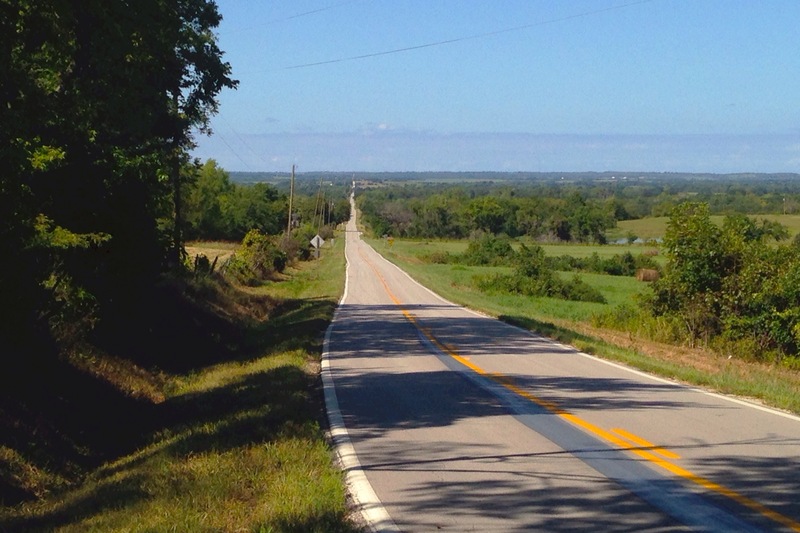 Unfortunately, the miles I’ve ridden here so far have also been just as dull as the main roads in the south, as today’s pictures will testify. They’re a pretty accurate reflection of quite how visually stunning the last few days have been. Maybe I’ve been spoiled by Laos? Still, that should all be about to change. I’m hitting mountains tomorrow. It’s about 300 miles (maybe 470 km) from here to the border with Myanmar. And it looks like there are four big ranges of hills before I get there (plus another one after the border). Two of those ranges are on the menu in the next couple of days. Two long (70-plus mile), and probably hot, days with 600 vertical-metre ascents (and descents, of course!) through National Parks. I’m hoping that this will mean less traffic and improved scenery. I’m also hoping that the hills won’t be quite as steep as some of the Laotian versions. And that I won’t make any more amateurish hydration errors. Those long days through the hills should drop me back onto the flat in time for whatever New Year’s Eve celebrations happen over here. I’d imagine that I won’t get another post in until New Year’s Day. So, let me pre-emptively wish you all the best for 2559 (or 2016, if you prefer). Three days, just under 300 km. Out of the hills, then a nice flat run along the Mekong river, then Christmas dinner in the capital of Laos, Vientiane. Couldn’t be easier, could it? Well, it could have been. Just a little bit. If I hadn’t somehow forgotten everything I used to know about riding a bike in the heat. It didn’t help that I was trying to push the average speed up. It certainly didn’t help that I’d only marginally upped my water intake from Vietnam, where it was about 15C cooler. This was especially dumb, as I know full well how much I need to drink when the weather gets warm. I say ‘little’, but it was actually around 300 vertical metres. It was 30 degrees C. And yes, it really was as steep as it looks in the picture (maybe a bit steeper, in places). But it still shouldn’t have been a major problem; I’ve done plenty worse. Trouble was, that I was already dehydrated. And that the hill was just 5 km into the ride, and after a rest day. So I hit it cold, hit it hard, and blew myself up spectacularly. I’ve been recovering slowly ever since. And giving myself a good mental kicking, as well as massive doses of water. On the plus side, the view from the top was spectacular. And that was the biggest lump in the road before Vientiane. Highway 8 from Vietnam eventually dropped me onto the flat, flat flood plain of the Mekong river, so I could take it gently to recover. Just one turn right onto Highway 13, and that was all the navigation done to get to the capital, too. I hit the Mekong itself at Pak Kading (above – the river Kading about to enter the Mekong). It’s just been a case of following it ever since. Me on the Laos side, Thailand waiting for me on the other side of the river. Two more uneventful days (heat, straight, flat roads, cheap hotels and litres and litres of water) saw me rolling into Vientiane on the afternoon of Christmas Day. I’d developed a slight obsession about cheese after leaving Vietnam; rural Laos really doesn’t have any, and I’ve always had a bit of a habit. Towards the end of the ride to the capital, a large, cheesy pizza and a large, cold beer had cemented themselves as the centrepiece of my ideal Christmas dinner. The reward at the end of Highway 13. Not exactly turkey and roast potatoes, but it was what was required. 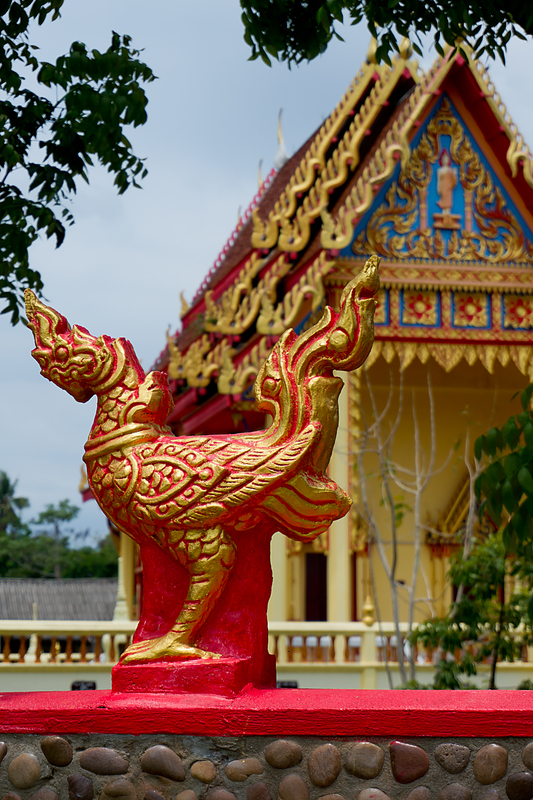 Today was spent poking gently around Vientiane on foot. It’s a really small capital city, and very relaxed. There’s a very European feel to it, too. So I drank a few coffees, ate a few pastries, and generally loafed about elegantly. Or as elegantly as one can in creased, plastic travel clothes. Tomorrow (Sunday), it’s back to the road, and another border crossing, just ten miles down the river from here. 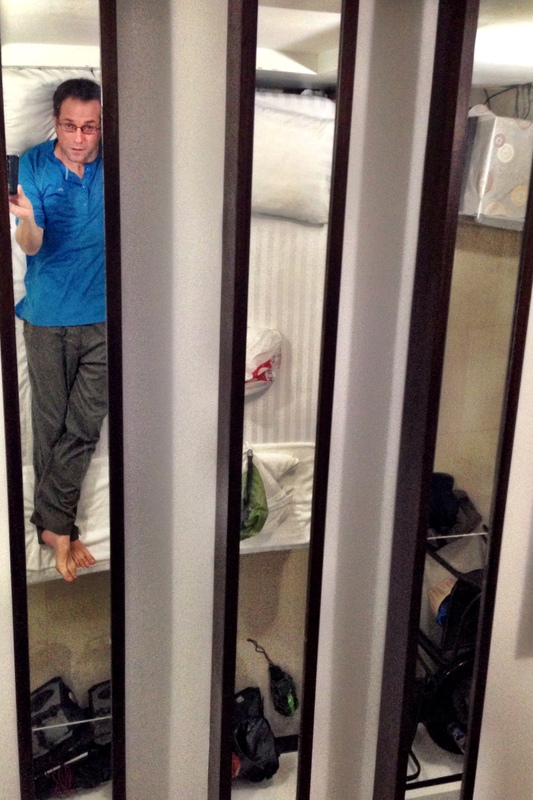 I’ll be leaving the ‘Communist’ world behind, and re-entering my nemesis, Thailand. Back onto the correct side of the road, but with a little trepidation after what happened last time I was there. It’s sixteen months (almost to the day) since I pedalled out of London to ride around the world. Seven-and-a-half since my unfortunate vehicular mishap in Thailand, thirteen countries and 9300 miles later. Two-and-a-half since I began my ‘comeback’ tour of the UK. And one-and-a-half since I got home from the far north of Scotland. I’m getting older and fatter. Rapidly. Summer’s long gone, and the UK’s experiencing the usual downsides of its location; constant streams of rain and wind whipping in off the Atlantic. The clocks have gone back, so it’s dark by four thirty in the afternoon. And getting darker every day. Having cheated the gloom and damp of the last English autumn and winter by cunningly being on the other, sunnier, side of the globe, it’s especially depressing. The passage of time does have some advantages. At the moment, it’s bringing me closer to resuming the round-the-world trip. Much closer. For the last eighteen months, most of my days have looked something like the picture above. In just a bit over four weeks, they will again. The road’s calling. 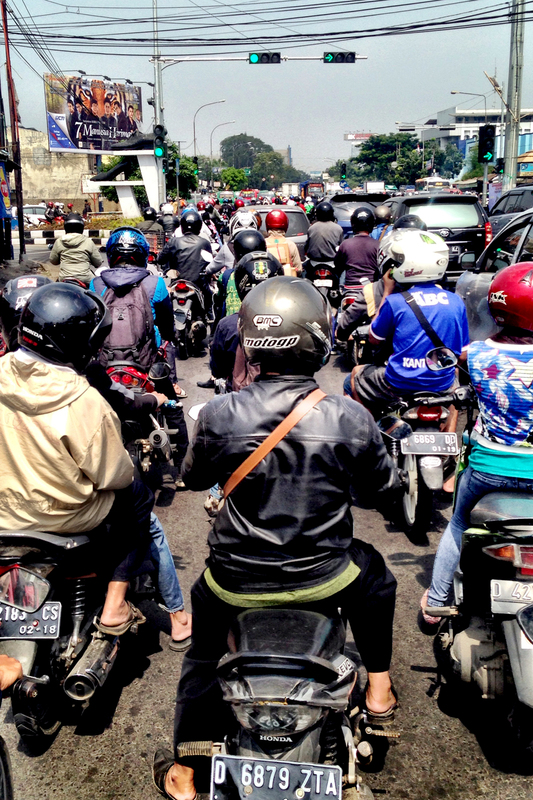 Because I’ll soon be back in South-East Asian Scooter Madness. I’m flying out to Vietnam in early December. I’ll spend a few days acclimatising to the heat (I rode into it slowly last time, rather than being dropped straight into the sauna). Then I’ll be on the road to Laos, then back to Thailand, then (assuming I get the visa sorted) to Burma / Myanmar. Then India. And then onwards. This obviously depends on all the usual things. Continued health, fitness, bike road-worthiness, visas, natural disasters and the weather. Oh, and careful avoidance of physical contact with goods vehicles. I might need to go south, rather than heading for the Silk Road through Central Asia. It’s even possible that Iran might start letting Brits travel independently again. Who knows? But whichever way it goes, I should be back in the sun soon, and back on the road. And back to peppering you with far more regular updates than has been the case of late. The future’s good, isn’t it? It’s six-and-a-half weeks since I was assaulted by the truck. I should probably be in India or northern Vietnam, depending on which way I turned at Bangkok. Then again, I should probably be dead. Instead of which, I’m at home in the UK. Which is a bit frustrating. However… After 42 days of pain, gradual improvement, and a phenomenally sedentary lifestyle, the last week has seen (in my limited little world, at least) some momentous changes. I’m down to one paracetamol a day, basically just to combat some back stiffness when I wake up in the morning. And on Tuesday, I tried driving for the first time since I left on the ride in July. It worked! Which was a major step forward. But the really good part is that I’ve been on the road on a bike again this week. The first, tentative miles on the way back to touring. The shoulder and back are still not fully fixed (not entirely surprising, I suspect). The muscles in my right arm have wasted from weeks in a sling, and, although I’ve got a decent range of movement now, I’ve got very little strength. Those nasty cracked vertebrae in my back severely limit the time I can be active before needing a nice sit down and a cuppa. And my breathing on the hills is a bit constricted by the cracked ribs, and possibly some internal bruising (incredibly, I still have bruises working their way to the surface after all this time). But I’m riding again, which is the main thing. I trundled a whole ten miles (16km) yesterday. Pathetic in comparison to the 50 to 80 miles a day (on a 40kg rig) which I considered normal a couple of months ago. But, importantly, that ten miles was light-years ahead of the four miles I managed on Monday. And those four were a big improvement on the wobbly mile-and-a-half I put in on Sunday’s first ride. It’s all going in the right direction. It’s strange riding in the UK again after so long overseas. You notice things you’d ordinarily take for granted (I guess I’ve still got my traveller’s eye in). It’s slightly alarming to ride on roads with no hard shoulder, until you remember that the driving standards here are actually pretty reasonable. And that I rode perfectly safely on these roads for years when I was a kid. And that I was riding on the hard shoulder in Thailand when the truck hit me, so the safety provided by a line of paint is illusory in any case. Of course, it’s not all rosy. After yesterday’s sun, it’s raining today (all day), which is pretty typical for an English spring. And somehow or other, the country managed to be so intimidated by scare stories about the ‘risks’ of Scottish people that we’ve instead voted for the risk of breaking up the EU and the UK within the next two years. Which seems a bit bizarre to me. Still, things are definitely on the up. I’ve pencilled in a fairly tough Sportive ride (135km distance / 1900m climbing) in mid-July to give myself a fitness target. I’m hoping I’ll be ready to do something before that, though. It’s been a busy, painful and tiring few days. And I think, after making sweeping (and potentially erroneous) statements like ‘the trip’s over’, and ‘only a smashed collarbone’ in my Thai hospital post, you probably deserve a little more of a considered appraisal of what’s occurred. I was in pain and in shock, after all. Not a good time to be making decent assessments. So let’s roll it back a little, and start at the start. 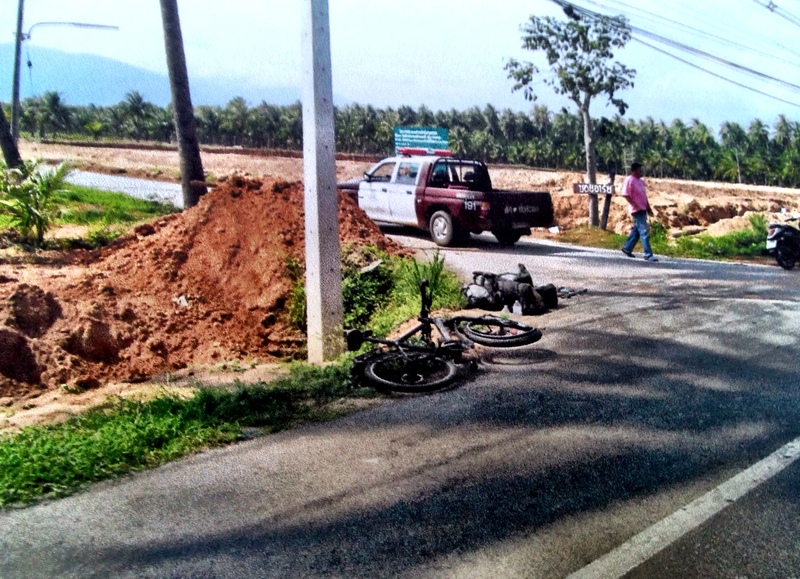 The roads in Thailand had seemed pretty benign. I was heading north on the coast last Sunday, with a gentle tailwind, in the sunshine, without a care in the world. I passed a temple or two. It was the middle of the afternoon. The road was quiet. And then the truck hit me. And then I woke up in hospital. My initial understanding of what happened was pieced together from shards of half-remembered conversations with doctors and policemen (quite possibly with a little morphine involved, too). Apparently, the truck had grazed the right-rear pannier on the bike, flipping the Beast and me sideways to smash my collarbone on the, erm, hard shoulder. The doctors had scanned me while I was semi-conscious, and my head and spine were OK. I was a very lucky boy. But the more I thought about it, the less some of this made sense. Why were all the scratches and scrapes down my left side, when it was my right collarbone which was damaged? How did I end up with a bump on the back of my head? And how was I knocked unconscious if I’d fallen off sideways? Time, crash scene photos, and endless scans and x-rays have clarified things a little since. The collarbone didn’t break on the road. That was a false assumption, based on how most cyclists pick up the injury. In fact, the truck really did hit me, as well as the bike. And it hit me hard. The bike went down on the left (that’s the scrapes and scratches accounted for). But all the damage to my shoulder was caused directly by the truck. Tons of metal on flesh and bone at a closing speed of about 60kph. Not what you’d call a fair fight. After finally getting back to the UK on Saturday evening (a long and tedious journey, of which little needs to be said), I spent most of the rest of Easter weekend in and out of another hospital. More scans, more x-rays. Every one identifying more damage. The truck pretty much took out the whole upper-right quarter of my torso. As well as the collarbone, my shoulder-blade is now in three big pieces (and several smaller ones). I’ve got at least four broken ribs. And at least four fractured vertebrae in my back to match. So that’s technically a broken back, then. Oh, and a bunch of neck vertebrae which now have bits missing. And so I won’t be riding a bike for a while. So far, so very, very lucky to be alive, sitting slightly uncomfortably on a sofa and writing a post. So very, very lucky not to be paralysed or brain-damaged. I’m actually a relatively happy bunny at the moment. If I’d arrived at hospital in the UK with those back injuries, I’d have been straight into emergency spinal surgery. If I hadn’t been wearing a helmet (smashed into a thousand tiny pieces), the truck’s indicator housing would have stoved in the back of my skull like an eggshell. And if one of the broken ribs had punctured a lung (apparently pretty common), I’d have been in real trouble too. None of those things happened. So it all depends how you look at it. Yes, I got hit by a truck. Yes, I need an operation on my shoulder (that’s next week’s fun-packed agenda). Yes, I’m finding it difficult to sit or stand or lie in comfort. But if you’re going to get hit hard by a truck, this is probably the best outcome you can hope for. I can walk. I can think. I can breathe. Is the trip over? Well, clearly yes, in its original form. Even if I had a break and then went back to finish my planned route, that would be two ‘half-way round the world’ trips, rather than one whole one. I’m a bit gutted about that. But again, a sense of perspective is required. Assuming the op goes OK, there’s nothing to stop me from cycling in the reasonably near future. 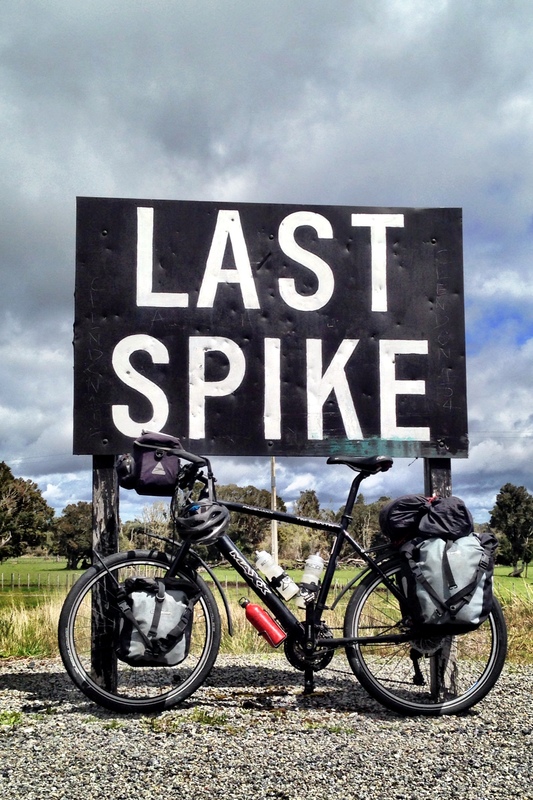 Am I finished with long distance touring? I don’t think so; I’m already climbing the walls with boredom here (that’s obviously metaphorical, given my condition). And I nodded off earlier, and had a dream about riding a bike through the Alps. Or maybe the Andes. Or the Scottish Highlands. Some hills, anyway. 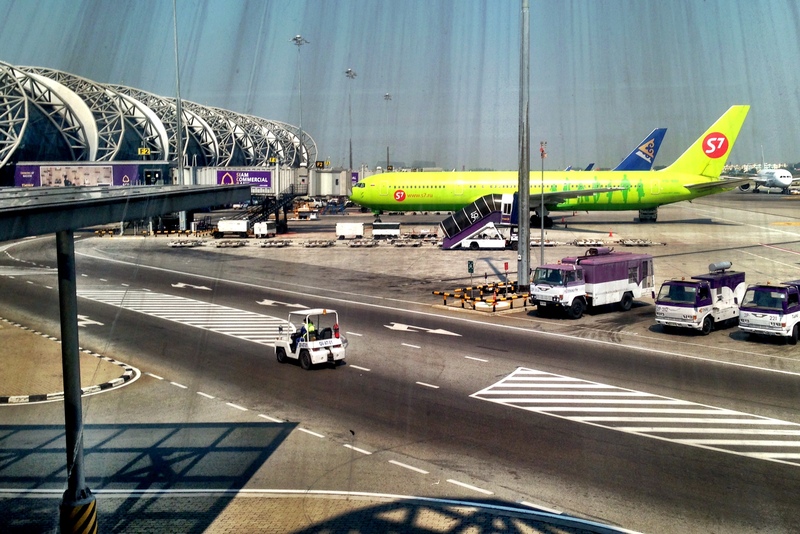 Will it be a series of shorter rides, or another intercontinental journey? Will I finish what I started, or start something new? I don’t know. Now, some truly sad news. Whatever the next ride is, I’ll be missing a faithful friend. The Beast is, erm, deceased (well, it more-or-less rhymes…). Tough old boot that The Beast was, the truck was one step too far. It just wasn’t worth trying to bring it back to the UK for repairs, especially as the truck’s insurance were willing to pay me out for it. So sadly, after over 15000 trouble-free kilometres (including a few before the trip), and at just over a year old (far too young), it’s time for me to look forward to whatever the next adventure is without the solid, heavy, reassuring presence of The Beast alongside. After the days on The Slab (and I’d been on that road, and its gargantuan identical siblings for far too long), the back roads finally beckoned on Wednesday. It was a nice change. Virtually no traffic, an almost total lack of diesel fumes to breathe, and time to stop to admire the view. But before that, there was the mystery of the multiplying bikes to work out. I parked up at the cheapest hotel in Chaiya on Tuesday evening, just before sunset. The Beast was accommodated in the lobby, tied neatly to the railing on the stairs, and completely alone. By the time I returned from grabbing some food, there was another bike trying (unsuccessfully, I hope) to mate with The Beast. And two more (very expensive) adventure touring bikes nestled together on the other side of the room. It was all very disturbing. I didn’t see them arrive, and I didn’t see the owners. It was like The Beast had just spawned a whole family in the time I’d been away. Terrifying. I didn’t see them leave, either. Disembodied voices were all I heard, the next morning, as they all scooted off a few minutes before my alarm meant I was ‘officially’ awake. Well, I did say I was a little slow in the mornings, didn’t I? I never did meet the Dutch couple who owned the adventure tourers. They were heading south. But, having struggled out of my pit with my usual enthusiasm, I rolled north on the back roads, hours later. And eventually saw a figure on a bike by the side of the road. A familiar bike; the one that had been cuddled up to the Beast. The figure turned out to be Ringo Zheng, from Shanghai, who’s riding north from Malaysia. He’s a really nice bloke. Amazingly enough, his name isn’t really Ringo at all. He picked it out of a list when he discovered his real name was hard to pronounce. And only then found out that he’d named himself after the least famous Beatle. Anyway, after a bit of chit-chat and some water melon, we got down to business. It’s been a while since I’ve had the chance to share the work with someone else, and it’s amazing the difference it makes. We took turns on the front, and were zipping along between 25 and 27kph (16-17mph) for a good few hours. Ringo was nice enough to shoot a video of me putting in a turn on the front, which, if you’ve not seen it on FB already, can be found here. I’m not sure it’s worth it unless you’re really interested in seeing what I look like from behind while riding. But I couldn’t have shot it myself, so it’s nice for me to have. For me, it was back on the Slab on Thursday, making a dull but efficient run to Chumphon, where I had a day off on Friday (and finally got my clothes washed – well overdue). And then, back to the back roads today. Hopefully, I can stay on them for the next few days. 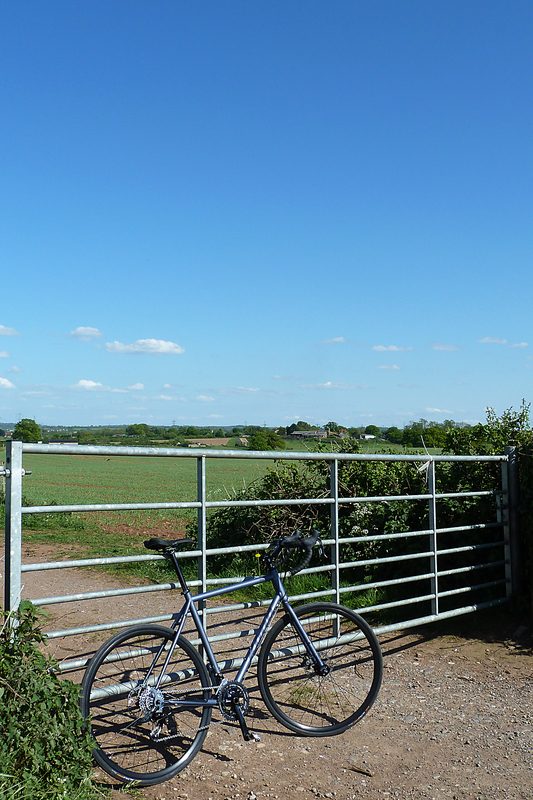 Apart from an increase in dog chases, which I haven’t had to worry about for ages, it’s much more pleasant riding. Being by the coast, you get the chance to have a look at the beaches (mostly empty) and the scenery without having trucks and buses constantly bearing down on you. And there always seems to be more interesting stuff to see away from the main roads, wherever you are. I’m still waiting for the hordes of tourists to emerge. Everything seems suspiciously quiet so far. But I’m edging into the resort areas now, so I guess it’s only a matter of time. 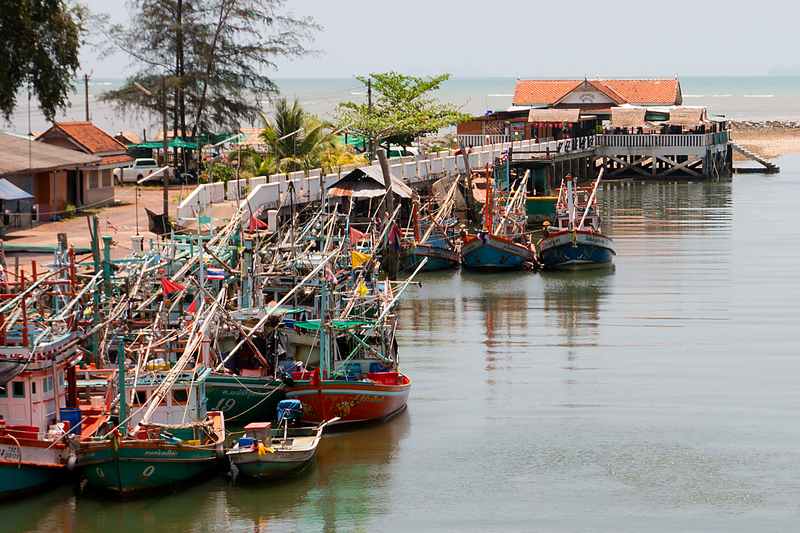 I should only be a couple of days to Hua Hin, where I was once part of those hordes myself. Not sure whether I will be again? It would be nice to think that being on a bike and going around the world makes you a traveller, rather than a tourist. 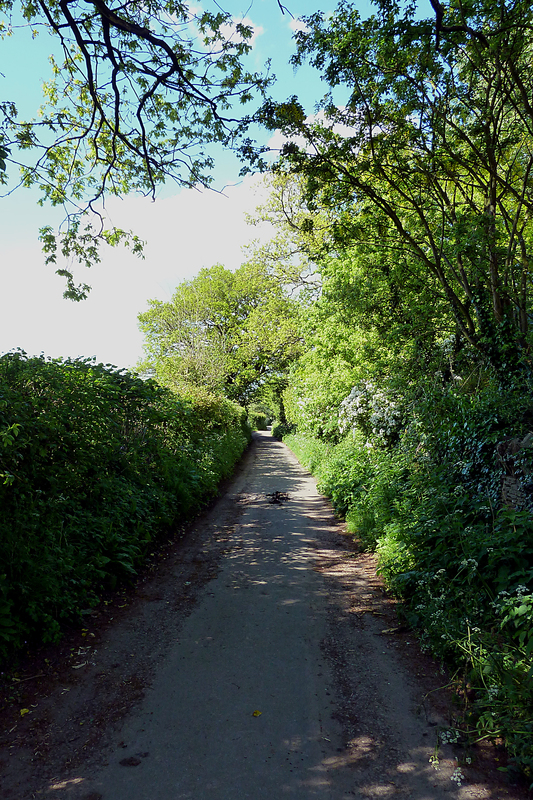 It certainly feels different on the small roads and in the little villages. But in a tourist resort, with a load of other foreigners? There are hardly any worse words with which to begin a post, I’d imagine. Sounds like a lecture on German public toilets, or something. 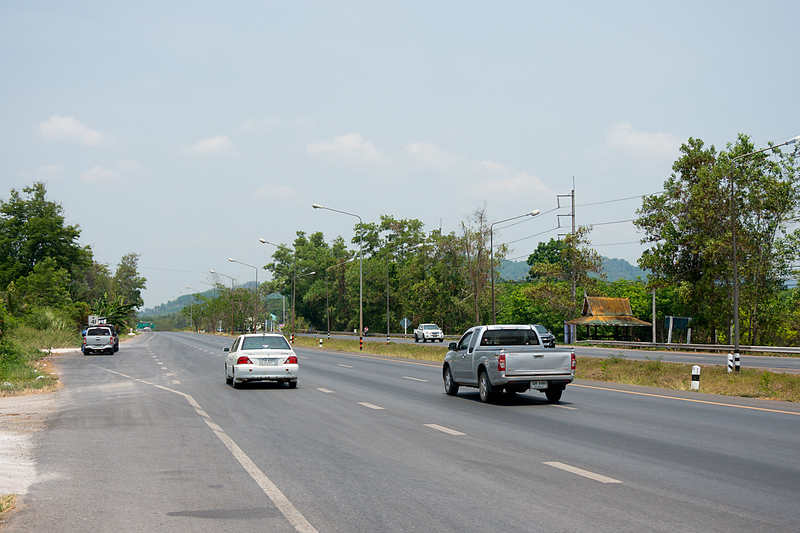 However, it’s the only way I can describe Thai Highway 41 (also known as Asian Highway 2). And it’s dominated the last few days. It’s a pretty flat, very smooth, unnecessarily wide and interminably long lump of tarmac that runs all the way up peninsular Thailand. It’s got me pretty much all the way across to the east coast. But it’s crushingly boring. And it’s hot. And it just goes on, and on, and on. I’m calling it ‘The Slab’. Thankfully, other events have taken my mind off it in the last couple of days. To start with, I stayed up too late on Sunday, and had an extra drink. Or two. I should know better than to have too much beer on a school night (especially now that ‘school night’ implies that the next day will involve a vast amount of sweating). But it was a momentous day, as I’m sure you’re all aware. Bristol City were playing Walsall in the FA Trophy final (now named after an otherwise obscure paint company) at Wembley Stadium. I spent ages trying to find a live stream. I ended up listening on internet radio. Not quite the same as being there. Still, City won 2-0, and will now forever be the first team to win the trophy three times. So you can hopefully understand why a small over-indulgence was called for. The lack of sleep (and, just possibly, a touch of delayed dehydration) caught up with me this morning. I felt abysmally rough, and failed to get out of bed with anything approaching enthusiasm. It was baking outside already, so I did some emergency re-planning, and settled on a much shorter day to give myself a chance to recover. I was, therefore, only about 60km down the road by three o’clock this afternoon, and nearly finished for the day. I saw a loaded touring cyclist, decked out in Thai flags on the other side of the road. He didn’t notice me, but I noticed a cafe behind him. I trundled over for a drink. And saw another loaded bike hiding in the shadows. It belonged to Colin. And, get this… Colin is from the UK. From England. From the West Midlands. From Walsall. What are the chances? Bristol and Walsall meet twice in three days. Once at Wembley Stadium in London, and once (with bikes) in a cafe in southern Thailand. And all because of that extra lager on Sunday. Isn’t that remarkable? No? Well, it’s as remarkable as this post’s getting, anyway. Now, the sharp-eyed among you will have noticed that the title of this post implies that more than one celebration should have been featured. The second has nothing to do with me, at all (not sure that the first one had that much to do with me, either, come to think of it). But it’s still well worth celebrating. My cousin Jess, and her husband Jay (though I’m guessing he’s getting less of the credit), have just had a baby girl! Congratulations and love to all three of you, and I’m looking forward to meeting Winnie when I get back home. And that seems like a good place to leave it for now. My dependence on The Slab should lessen from tomorrow onwards, as smaller coast roads link the various seaside resorts and hotels along the shore. There might even be something interesting to write about next time. Mankind has evolved away from using letters. People make do by scrawling impossibly long lines of runes on incredibly detailed signposts. Nobody can drive very fast, as they need so much time to decipher the signs. Oh, and there’s very little cheese in the shops. Although there’s plenty of everything else, including sweet – very, oddly sweet – shredded chicken buns. Yup, that’s chicken. Sugary chicken. Or maybe I just crossed the border into Thailand. I did check, you know. They said it was an hour behind Malaysia. Nobody said anything about Thailand being five-hundred-and-odd-years ahead. Less the hour, of course. But it really is 2558 here. I know, because the date is one of the very few things you can understand after putting the Thai language through Google Translate. While it’s good to know that we’ve managed to develop a Star Link to Bora Nasser by 2558, the rest of this makes very little sense to me. Even allowing for Google’s less-than-legendary grasp of language, it should be easier to understand than this, shouldn’t it? 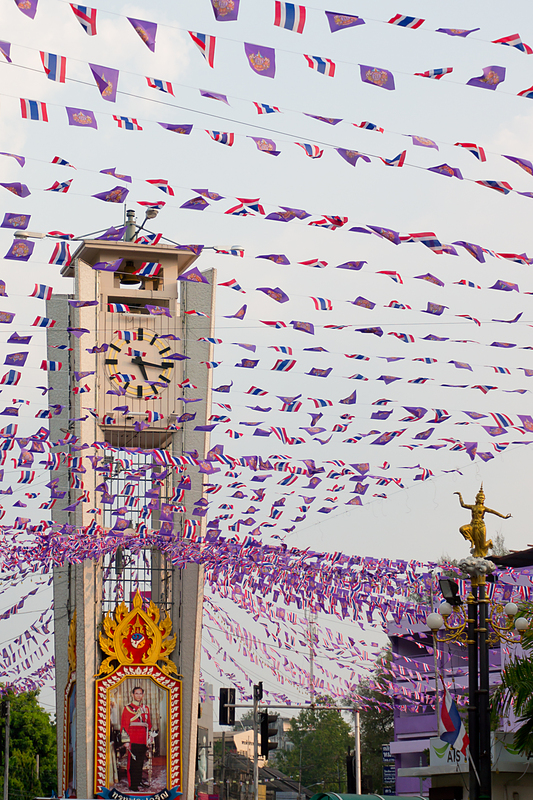 Anyway, despite the language issues and the future shock, the first couple of days in Thailand have been promising. I’m really in the deep south of the country at the moment; it’s very rural, and with very few tourists (I’ve heard that most of Thailand is over-run with them). The roads are nice and smooth, and the drivers are civilised, not unlike Malaysia. The weather’s hot and humid. Again, not unlike Malaysia. The countryside’s a bit more interesting here, though. 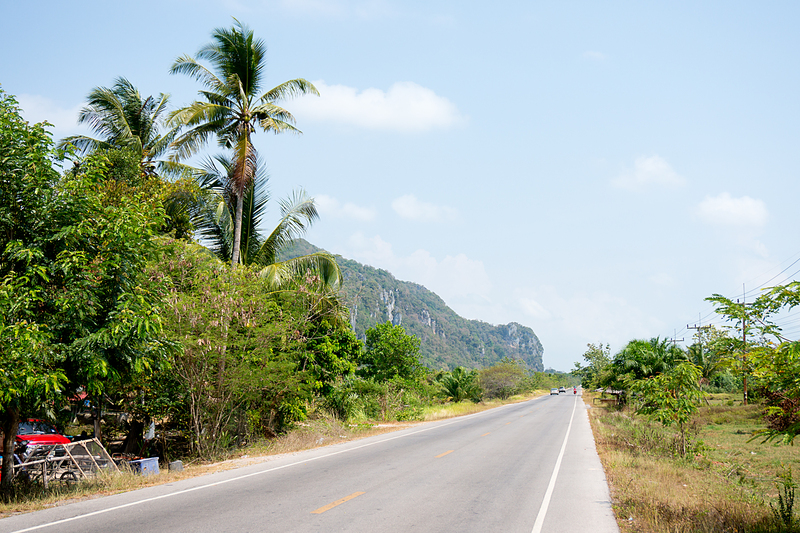 The biggest difference on the road is that there are hills on the Thai side of the border. Not especially big ones, and with space between for the road to snake through with minimal climbing, but hills, nonetheless. And the biggest cultural difference is that I’ve moved from a majority-Muslim democracy to a majority-Buddhist constitutional monarchy under military control. They take their royals very, very seriously here. I think there must be some sort of significant event or anniversary on at the moment, as the place is festooned with flags and portraits. I’ll probably work out what the fuss is all about while I’m here. I’ll let you know if I do. Well, there’s your first bulletin from the future. I’m off to check on the next few hundred years of football results, so I can get some bets on, if and when I make it back to 2015.